Let’s be honest, hands down, the world over, breakfast is the best meal of the day. Breakfast food is just so wonderfully flexible. It can be savory. It can be sweet. It can be a combination of the two. In many parts of Asia, breakfast is a bowl of a thick savory rice porridge (congee) made with chicken (or pork) stock and served with slivers of meat and vegetables. As someone who frequently salts & peppers her morning oatmeal, I think that sounds delightful. In China, dim sum is a perfectly legitimate breakfast option, and you have to appreciate any country where breakfast can be made up of dumplings. In the Netherlands they put chocolate sprinkles on buttered bread and call it a balanced meal. Or, sometimes creamy slices of cheese on raisin bread (and sometimes the raisin bread has a log of almond paste down the middle of it – if you think that sounds revolting, all I can say is don’t knock it until you’ve tried it). In Scandinavia they serve thin slices of dark rye bread with smoked meats and fish. In England they throw the contents of the fridge into a frying pan and serve it up with strong black tea. In America breakfast can be pancakes, or French toast, or eggs cooked in a bewildering variety of ways (scrambled, poached, fried, soft boiled, omeletted, dropped into a hole cut in a piece of toast and fried), and usually comes with a side or bacon. Not much is made worse with the addition of a side of bacon (excepting brownies and ice cream sundaes, where bacon is a rude interloper). In France they sip bitter coffee and tear into flakey buttery croissants while standing at the counter of the local café. The Australians eat vegemite for which there is no excuse, but make up for it by drinking coffee through a candy bar (okay, I don’t know if Austalians do Tim Tam Slams as part of a breakfast ritual, but whenever they indulge in this method of drinking coffee you have to admit it’s pretty awesome). The only thing better than breakfast at breakfast time, when I’m not usually awake enough to appreciate it, is breakfast for dinner. I have a theory that you can go around the world in 80 Breakfasts without ever leaving your dining room. My goal for the year (? – well, the next little while anyway) is to explore breakfast options around the world. 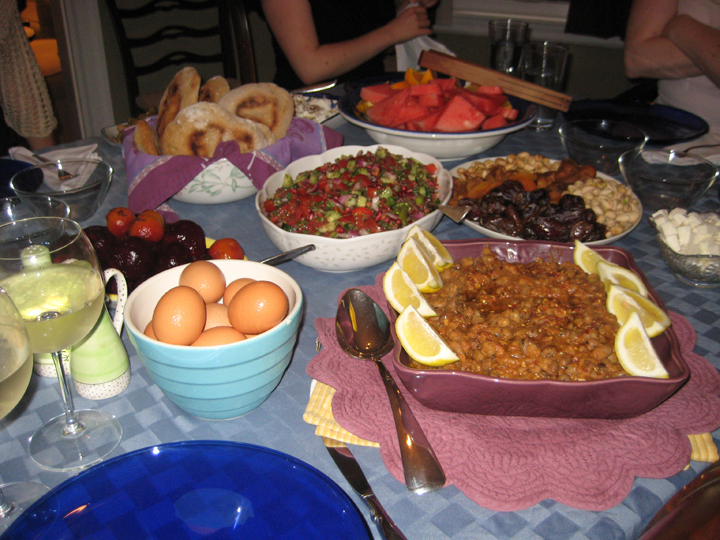 For our inaugural trip we’re starting in the Middle East where breakfast is a mezze style meal involving a little of this, and a little of that – some hard boiled eggs, some bread, some dried fruit, a scoop of stewed beans (well in Egypt anyway), a drizzle of honey, some fresh cheese . . . . I knew in my heart of hearts that finding small/baby fava beans was going to involve a trip to Watertown and the Armenian grocery stores that line Mount Auburn Street. I stubbornly hoped, for the sake of my Saturday schedule (because they’re not open on Sunday, because they’re Armenian and Orthodox and in church on Sundays), that I would be able to find small dried fava beans at (a) Whole Foods; (b) Wilson Farms; (c – admittedly a long shot) Stop-n-Shop; (d) one of the Indian grocery stores along Mass Ave in Cambridge; or (e) the Halal grocery store/butcher at Haymarket. 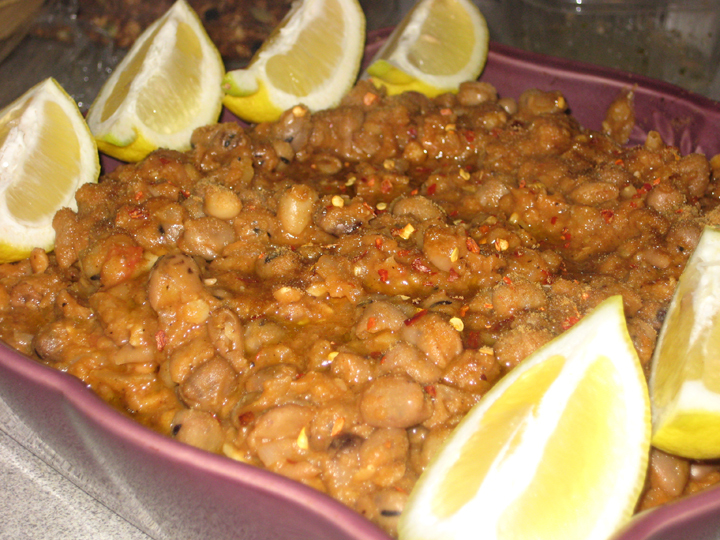 Actually I was a little surprised I couldn’t find them there, they had split fava beans, and canned ful medames, but not the right kind of dried fava beans to make ful medames from scratch (the right kind of beans are pictured below – these are cooked, but you get the idea). No dice. No dice to the point where everyone I asked looked baffled as to what this ingredient even was. This makes sense. Ful Medames is an Egyptian dish (sometimes described as their national dish), not an Indian dish, and apparently baby fava beans have yet to make it to the Whole Foods indie-vegetarian crowd. However, when I walked into Arax Market at 7:30pm on Saturday night, they had so many varieties of fava beans that I had to take them all up to the counter and ask someone which one I should be using. I got passed along the counter until I reached a woman who pointed unerringly to the bag of whole (not split) small dried beans. When I revealed that I’d never actually had ful medames before, and that I was making them essentially blind she looked a little alarmed (also bemused as to why I’d make a dish I’d never had before, and why I go to the trouble of making it from scratch as opposed to using the handy canned variety) and started gently interrogating me about how I was going to make my ful medames. She nodded approvingly when I confirmed onion, and garlic, and cumin. She looked positively alarmed when I hesitantly mentioned coriander, so I backtracked hastily. She reassured herself twice that I was going to serve it with lemon wedges and lots of parsley before she let me pay and leave with the bag of dried beans. If I’d found the beans in Whole Foods I would never have had this interaction, and not only might I have added coriander to my ful medames I would also have lost out on being a part of a cultural exchange. So, in the end it was all the good that I had to make a small pilgrimage for my beans (I mean, really, Watertown is a 10 minute drive from my house so this wasn’t all that much of an inconvenience). 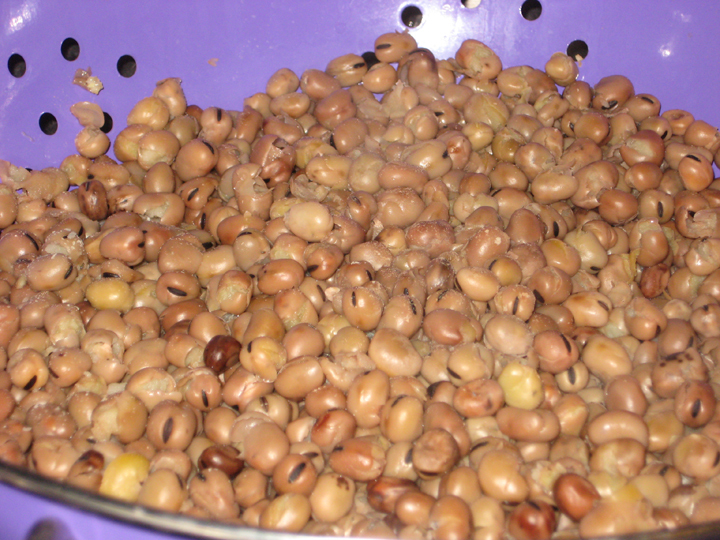 Cover the dried beans with at least 1” of water and soak overnight. Drain the beans, and then cook in plenty of water until tender (about 60-90 minutes). Reserve 1 cup of the cooking liquid & then drain the beans. While the beans are cooking, sauté the diced onion in a little olive oil until golden. Add the garlic and sauté until fragrant (about 1 minute). Add the cumin, and red pepper flakes and sauté until fragrant (about 30 seconds). Add the tomato paste and cook until it has darkened slightly (about 1-2 minutes). Cool & reserve. Return the beans to the pot with the reserved cooking liquid, the lentils, and the sautéed onion mixture. Bring to a simmer and cook for about 15-20 minutes, or until lentils are broken down and mixture has thickened. Season to taste with salt/pepper and lemon juice, garnish with a generous sprinkle of chopped parsley, and serve with lemon wedges. Basically the only thing this recipe requires of you is time and a little real estate in your fridge. You can use whatever fat content of yogurt you want to – full fat Greek yogurt will net you something that tastes like cream cheese, 2% Greek yogurt tastes decadent without being overwhelming, 0% Greek Yogurt will still taste pretty awesome just not quite as creamy. I was going to be decadent and use full fat yogurt, but was unable to find any, so I went with just a little decadence and used 2%. You can also do a sweet version of this – omit the salt, and instead stir in a little cinnamon or cardamom (and, if you have some on hand a little rosewater – but just a little, because a little rose water goes a long way). 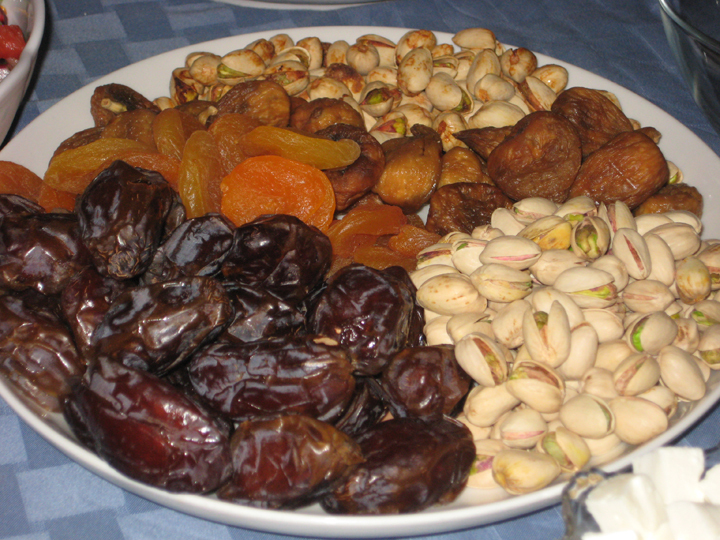 Then proceed as below, and serve with fresh fruit and a sprinkle of coarse sugar. Line a colander with cheese cloth or several layers of paper towels. Mix the yogurt and salt together, and then spoon into the lined colander. Suspend the colander over a deep bowl, cover, and refrigerate for 8-48 hours (the longer it drains, the firmer the cheese will be). Peel the cheesecloth or paper towels from the yogurt which will have now become cheese like and transfer to a shallow bowl or plate. Use the back of a spoon to create dips & swirls in the surface. 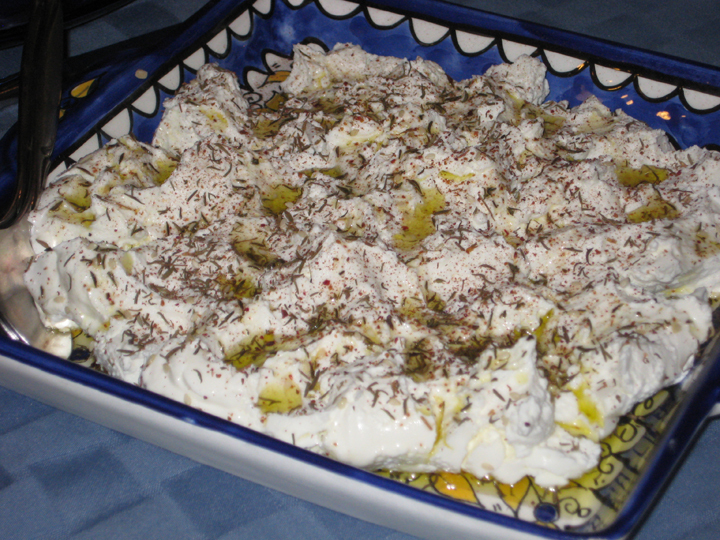 Sprinkle generously with za’atar (or fresh mint, dill, basil, coriander, garlic . . . basically whatever sounds good to you), and drizzle with good olive oil. Serve with pita and/or fresh vegetables. 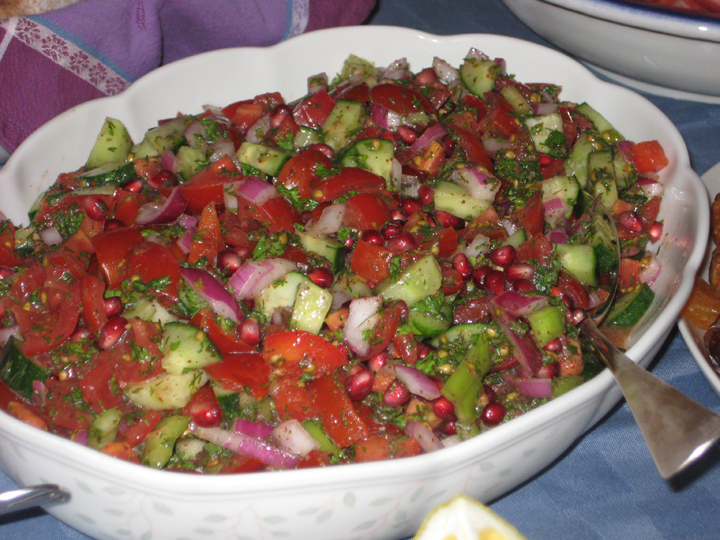 I like to add pomegranate seeds to my Shepherd’s Salad. It’s untraditional, but I like the bright sweet pop of the pomegranate seeds against the acidity of the lemon juice and herbs. Combine all of the ingredients except romaine in a large bowl and refrigerate for 30 minutes. After 30 minutes toss together, taste and adjust seasonings. Serve with romaine leaves. On the one hand, I can get very good freshly baked pita without much effort. On the other hand, I have this long standing appointment with my stand mixer to make something involving yeast. My determination to conquer (or at least start to conquer) my fear of yeast won out over convenience (with the comforting knowledge that if it all went horribly wrong there was a back-up plan in place). I exchanged (many many many) emails with my friend (the exceedingly patient) pastry chef about the logistics of this. Then, on Sunday with trepidation I mixed my dough and held my breath while I waited to see if it would rise. It rose. And then it rose some more, and then it rose a little a more, and I started to worry it would stage a hostile takeover of my fridge. Monday night I divided and rested and rolled and baked my pita (and just about gave myself heat stroke by having the oven on at 500 for nearly an hour). They poofed and browned and did all the things they were supposed to do. I made whole wheat pita this time, for no particularly good reason except that the recipe seemed like the most stream lined of all the recipes I came across and I don’t know enough about baking to know how to adjust water content if I change the flour mixtures. Next time I think I’d try an all white flour version (although honestly, while I am impressed with myself, I’m not entirely sure that the pita I made are so much better than the pita I can get at the halal market down the street from my office, that the time and effort is worth it. I might think differently if I hadn’t been baking in 90+ degree weather, perhaps the next time I try this I’ll wait until the winter). Remove the plastic wrap and return the bowl to the mixer stand, fitted with the dough hook. 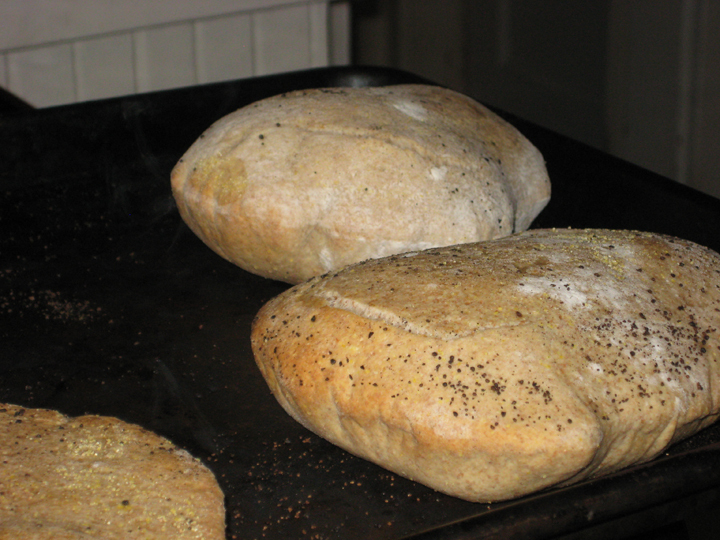 Add the remaining ¾ cup of warm water, 1¼ cups bread flour, 1¼ cups whole wheat flour, olive oil and salt. Knead on low speed until the dough is smooth and elastic, about 8 minutes. Transfer the ball of dough to a lightly oiled bowl, turning once to coat, and let rise in a warm draft-free place, about 1 hour, until doubled in bulk. At this point you can refrigerate the dough overnight. Punch it down before you put it in the fridge, and check on it before you go to bed to see if it needs to be punched down again (I punched mine down twice, and then again in the morning before I left for work just to be safe). Place an oven rack in the middle position. Place a baking stone in the oven (if using) and preheat to 500? F for at least 20 minutes. 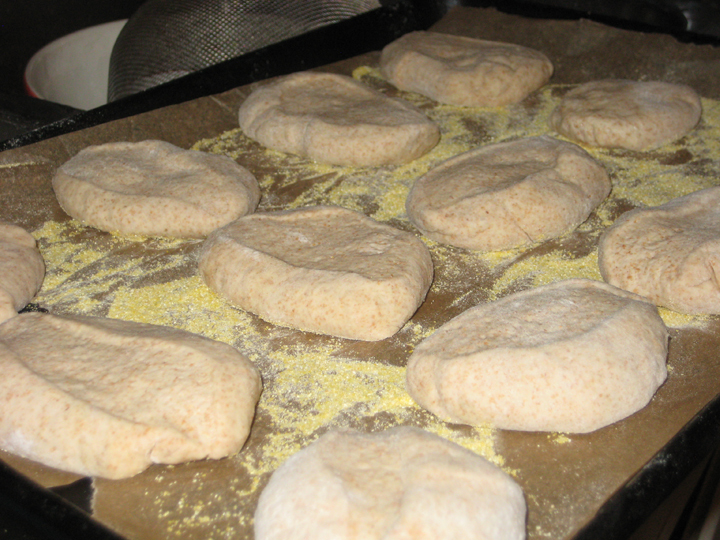 Transfer the risen dough to a lightly floured work surface and divide into 8-10 equal pieces. Form each piece into a ball. Flatten one ball at a time into a thick disk place on a baking sheet lightly coated with cornmeal (to prevent sticking), loosely cover, and allow to rest for 20 minutes. If you’re not using a baking stone, place a sheet pan in the preheated oven and allow to preheat for 10 minutes. Working with about 3-4 dough balls at a time, transfer them to a lightly floured surface and roll out to 4-6” rounds (how large a round you get will depend on whether you divided your dough into 8 or 10 balls). 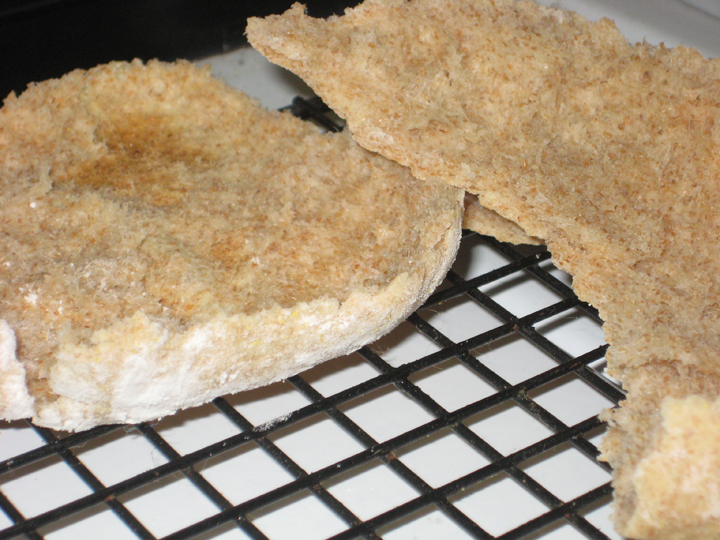 Place on a lightly flour surface, cover loosely, and allow to rest for 10 minutes. When the pitas have rested, remove your preheated (screamingly hot) baking sheet from the oven and (working quickly) transfer 3-4 of the rolled out pitas onto the baking sheet (how many depends on the size of your pitas and the size of your baking sheet – you don’t want them to be touching). Bake for 2-3 minutes, flip them over and then bake for another 2-3 minutes. They should balloon and turn lightly golden. Transfer the baked pitas to a cooling rack, return the (empty) baking sheet to the oven for 3 minutes to reheat, and then repeat above until all dough balls have been rolled, rested & baked. Either serve the pitas immediately, or cool completely and store in an air tight container for several days.